Jereme Zimmerman is our kind of home brewer. In his first book, Make Mead Like a Viking, he explores the history of and gives fermentation advice for mead, a booze we’ve had plenty of practice making. And he has now repeated the trick with beer. His latest book, Brew Beer Like a Viking, is partly a historical stroll through the origins of beer, in the days before hops, and partly a recipe book for anyone wishing to brew using methods that are considered unconventional by today’s standards. And there are loads of unusual ingredients to experiment with along the way. Eager to find out more about his brewing experiences we rustled up some questions for Jereme and he kindly served up one of the most fascinating set of responses we’ve ever received. How did you get into home brewing? I started around the year 2000 when I moved from Kentucky to Seattle. I had grown up on a small Kentucky farm and spent my childhood watching my dad make wine (and occasionally sneaking a bottle) in between all of the chores involved in maintaining an old farmhouse and a 40-acre homestead. He mostly made “country wines” from garden produce and fruit he had grown himself. Later in life he told me stories about making corn wine, dandelion wine, sumac wine, and wine from all kinds of other grown and foraged ingredients, including grapes he cultivated himself. From that background I found myself with a yearning for doing some sort of a DIY hobby from my small Seattle apartment. Since I couldn’t throw a stone without hitting a brewery or brewpub, and was much more interested in beer than wine at the time, beer seemed the natural choice. So, I headed up the street to a homebrew shop, picked up a brew kit and a copy of Charlie Papazian’s The Joy of Homebrewing, and headed home to brew up a batch. From there, I brewed several kits, often modifying them with my own ingredients (such as adding some Washington Bing cherries my wife and I had picked into a stout). Over time I relied less and less on kits and eventually went to buying the ingredients separately and creating my own recipes. Your book is quite unconventional in that it covers alternatives to standard grains, hops and yeasts. Why did you decide to go down this route? Well, I suppose I’m just an unconventional person! I’ve always had a tendency to do exactly the opposite of what I’m told to do and to think the opposite of what I’m told to think. In all seriousness though, I didn’t set out with a goal of brewing with and writing about unconventional techniques and ingredients. My current brewing practices stem from my background of growing up living off the land and my interest in history. As I delved deeper into my research in historical brewing I was surprised to find all manner of ingredients and techniques that just don’t exist, or are heavily frowned upon in modern conventional brewing. I started this all in leading up to my first book Make Mead Like a Viking. I had the thought of looking into how people brewed before they had access to homebrew stores and websites and mead seemed the natural starting point since it is likely the oldest fermented beverage due to its simplicity. I initially documented my experiments and research on a now-defunct homesteading website Earthineer, writing under the penname RedHeadedYeti. I quickly found that there was a strong interest in my style of brewing and writing and began travelling to teach about mead, wrote some magazine articles, and eventually wrote a book. In researching for the first book, I discovered a lot more about beer history than I did about mead and felt that information needed to be put into print as well. When Make Mead Like a Viking had been out a couple of years, my publisher Chelsea Green Publishing asked if I had an interest in doing another book. 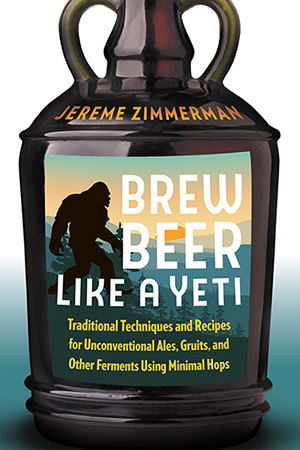 I was itching to get back into beer brewing and looking deeper into the research I had started, so I got started on what would come to be Brew Beer Like a Yeti. You advocate that home brewers should ‘have fun and learn from your mistakes’. What are the notable mistakes you’ve learnt from? o answer your question though, an example of a notable mistake would be the time I brewed a five-gallon batch of wormwood ale. I had read in Stephen Harrod Buhner’s Sacred and Herbal Healing Beers that it was a traditional bittering agent before hops gained prevalence, but he also warned that one would have to be brave to brew with it unless you had a penchant for tongue flagellation. I used what felt like a small amount (half of a one ounce packet from a homebrew supply store) and the result was so bitter it was practically undrinkable. Eventually, I ordered some wormwood from an herbal supplier and decided to brave it again. I compared the taste of the dry herb from the herbal supplier to what was left from the packet from the homebrew store and found that even a tiny amount of the initial packet on my tongue was terrible, while the newly purchased herbs had a noted bitterness but also some floral undertones. I don’t know that this was necessarily a mistake but it was definitely something I learned from. I’ve enjoyed the brews I’ve made with wormwood since that first terrible one. The lesson here is that it’s a good idea to taste (or make a tea from) a new ingredient before brewing with it to make sure you’re going to be able to handle the flavor. And what are the brewing successes you return to time and again? When brewing with all grain in particular I like to throw in a lot of adjuncts, but my go-to for a simple, near-foolproof all-grain beer is to just brew with 100% barley pale malt, minimal low-alpha hops (with the occasional herb thrown in), and a British or Belgian ale yeast. I’m pretty much guaranteed a fairly simple brew day and a super tasty beer. When I’m feeling more “ancient” and Scandinavian I do something similar but instead of hops I throw in some juniper branches and berries and ferment with bread yeast. Sometimes I also toss in some meadowsweet and yarrow. These were common ingredients for early Scandinavian beers such as sahti, and are still used in traditional farmhouse brewing in places like Finland and Norway today. Besides brewing advice the book is also packed with stories and folklore. Did you have much difficulty in tracking down the historical information? Tracking it down wasn’t so much difficult as it was time-consuming. I was an English major in college and have been researching and writing for many years, so I already had a penchant for research. The difficulty was in verifying the information I found. Beer books, even by the most respected of writers, are chock full of myths (the untrue kind, not the storytelling kind) that have been passed down from book to book to the point that they’re accepted as fact. Thankfully I have some friends with similar interests who are dedicated to extreme accuracy in recreating and writing about period brewing who helped me debunk myths and provided me with sources I never would have come across on my own. One in particular is Susan Verberg, a Dutch immigrant who now lives in New York State. She is a historical reenactor and is fluent in Dutch and German. She passed along resources from the Netherlands that were in English, or translated portions for me. She was particularly helpful in researching gruit, although we both find that to be a maddening subject. It originated in the Netherlands and most of what has been written about it very well may not be accurate at all. I touch upon this in Brew Beer Like a Yeti but that’s a subject that needs a lot more solid research… I’m also thankful to a couple of beer blogs I follow religiously, in particular Norway’s Larsblog, Finland’s Brewing Nordic, British beer archeologist Merryn Dineley and British beer writer and beer myth debunker Martyn Cornell’s blog Zythophile. In the end, though, I had to go with what seemed the most accurate. When it comes to history you can never really say for sure and you can drive yourself crazy following what I call rabbit trails. You’ve got to stop at some point! If you could drink beer from any time and place in history, where and when would it be? I would want to go back as far as possible to when people were first figuring out how to malt grains, crush them with rocks (saddle and quern), and brew by the most rudimentary methods such as heating the wort with hot rocks. I’d really like to know if my attempts at emulating those brews are even remotely close to what they tasted like. Then of course I’d like to fast forward to Viking / Anglo Saxon times and enjoy a good mead hall feast! One of your recipes involves using spit as part of the process. Can you briefly explain how that works and how do your friends react when you offer them a taste? Yeah, that one tends to gross people out but it’s a very traditional and ancient South American brewing method (and was likely employed by Neolithic man in other periods). It’s really no more gross germ-wise than eating at a restaurant, where you’ll be exposed to many more germs. The spit is involved in the starch conversion process. You boil the wort and ferment it with yeast like you would any other beer, so any spit is long gone by the time you drink it. Although there are many indigenous South American beers brewed this way, chicha is the one most people are familiar with. Chicha can be brewed with standard malted grain (corn instead of barley), but the chicha made by the spit method is chicha de muko (muko are the little spit balls you make from ground up corn). Essentially, human saliva has enzymes that help convert starches to sugars similar to what happens in the malting process. The catalyst for this process is the diastase enzyme (ptyalin), which causes carbohydrates to break down into sugars. I can tell you that it is a very tedious process chewing up all that corn. Even when I soaked the hardened corn kernels in water first, or ground it coarsely it took me a lot of time (and a good amount of Netflix binging) to chew up enough for a one-gallon batch! I could see why this was traditionally done as a communal thing, with everyone sitting in a circle, telling stories and spitting into the same vessel. Unfortunately, even the most rustic and adventurous of my friends refused to help. My friend Steve Cole would have, as he’s participated in some of my more extreme brewing adventures, but he had a lot going on in his life at the period I was experimenting with this. I would say I may try it again with Steve someday but to be honest the chicha recipe I have in the book that is made by malting corn kernels the standard way is so delicious I’m not terribly interested in trying the spit thing again! As for offering my friends a taste, well, I’m afraid I drank it all. I may have been able to convince someone but chicha de muko is meant to be drank young while it was still fermenting, as it turns bland and then sour quickly due to the lack of hops or other antiseptic herbs, so I wasn’t waiting around. I can say that it is delicious young. Sweet, flavorful, with just a bit of tang. Some of my friends did try (and enjoy) my chicha made with standard malted corn, malted barley and a hint of hops, though. What are some of the other unusual methods or ingredients readers will come across? I would say sahti and other ancient ales are a good example. I found in my research into Scandinavian farmhouse brewing that there was huge range of techniques involving various levels of heating the mash and wort. Some involved little-to-no wort boiling, varying mash temperatures well outside the norm of modern homebrewing, or even boiling the mash and the wort together. Most, but not all, used juniper for bittering, flavoring and disinfecting the brew, and yeast was passed along from brew to brew and from generation to generation. In Finland the same yeast was used for bread baking as beer brewing, hence the use of bread yeast. If there’s one ingredient you would encourage home brewers to start experimenting with, what would it be? There are so many but one of my new favorites is juniper. Be careful how you source it, though. The juniper used in Scandinavia has edible branches and berries, but there are many forms of juniper that are toxic. They may not kill you but they’ll make you sick. I’m not sure that it is prevalent in the UK so some brewers may need to special order it. If you forage for it in the wild like me, make sure you can 100% positively identify it. There are European varieties that are toxic, usually the ones in shrub form. In the US, it’s best to only use the varieties that are in tree form. Eastern Red Cedar (Juniperus virginiana) and Rocky Mountain juniper (Juniperus scopulorum) are two common edible varieties here, although I understand the flavor may be different than the Scandinavian variety. Juniper is an ingredient that has somehow been nearly completely ignored by brewers and brewing historians. I, and others who are undergoing similar research paths, am finding that it very well may be one of the oldest brewing ingredients and was very likely used much longer than hops. The flavor takes a bit of getting used to but I think it’s a great alternative to hops for its bittering, flavoring and antiseptic qualities. Even better, all I have to do is take a short walk out the back door to gather some! The post Interview: Fermentation revivalist, experimental brewer and booze author Jereme Zimmerman appeared first on Two Thirsty Gardeners.